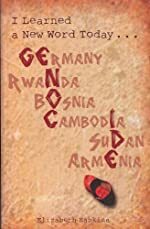 Review: Genocide - a topic typically reserved for 8th grade history (at the earliest) is opened up to younger audiences in Elizabeth Hankins novel, I Learned a New Word Today . . . GENOCIDE. Hankins tackles a very difficult task - making a painful mature topic appropriate for children, and she has success. Javier is a 5th grade student who is studying genocide in school, and the novel is his journal that is kept as a class assignment. At the start of the novel, Javier is introduced to the concept of genocide, and as a preliminary activity he visits the Holocaust Museum in Washington, D.C. He is horrified at what he finds. Throughout the novel, Javier shares his learning about not merely the Holocaust, but also about five other major genocides, one of which is still very much in the present. Through his lessons at school, Javier is taught not only to learn about genocide, but also that it is critical to become active in taking a stand against genocide. He brainstorms several ways to help, and ultimately develops an excellent plan. But, the novel is much more than just a history lesson taught through a different modality. The reader gains a glimpse into Javier's life. Dark secrets unfold as Javier learns more about the people around him and about the tragedies in the world. I Learned a New Word Today . . . GENOCIDE combines history, mystery, and humor in a priceless novel that teaches an invaluable message. Hankins does a nice job trying to take a history lesson and not only make it appropriate for younger readers, but also make it seem like it's not really a history lesson. Although at times, the reader does feel as if it reads a little like an elementary textbook, the charming antics of Javier keep the pages turning. It is a little difficult at times to buy into the fact that a 5th grade child would be writing this much detail in a journal, and in an effort to make the writing seem like a child, Hankins includes many choppy sentences - definitely a sign of a younger writer. However, the higher-level vocabulary Javier uses, along with the thoughts that go on in his head and the fact that he wins a writing contest, would lead the reader to believe he wouldn't really be writing in such choppy sentences. Nonetheless, that's a small concern. What Hankins did in writing this book is nothing less than commendable. She uses imagery to create such an important message. For example, when writing about the genocide ghosts in Javier's head she writes, "The ghosts are all different just like the people who died in these genocides were. But the thing that they all have in common is this: All of them look like people. And all of them twist and turn in this ugly dance before they just fade away to nothing." This novel is not a novel for a child to sit and read alone. It should be read with guidance from an adult. There is so much in this book that requires processing with an adult. Actually, I would recommend that any teacher of middle school who is teaching about genocide should obtain a copy of this book. In fact, I would go so far as to say that I Learned a New Word Today . . . GENOCIDE should be a companion book for every child studying genocide. The class discussions would be enriched so much after reading a book such as this. Thank you Ms. Hankins for finding a way to present the atrocities of life to a younger audience. After all, the inner desire to be an activist is planted at a young age. We would like to thank Planned Television Arts for providing a copy of I Learned a New Word Today . . . Genocide for this review. Have you read I Learned a New Word Today . . . Genocide? How would you rate it?